Welcome to Pluma Designs. I am Hilda Villaverde owner and manager of a unique boutique salon in the heart of Scottsdale, Arizona. Our Mission Statement is to create lasting beautiful days in every client’s life through healthy, gorgeous hair. We anticipate, listen, connect, and deliver results through continuous education and by listening to your needs. We start with what you want and give you 100% of what we do… hair! Meet the Amazing Pluma Team! We start with what you want and give you 100% of what we do…..hair! Ask us about other Eufora Products too ! When ‘cocktailing’ products, know in what order to apply. Boost is a root lifting spray. Using fingers to lift hair off scalp, spray directly into root line. Blow dry hair away from scalp. Before the blow dry, apply Thermal Defense Prep a multi-benefit prep spray that protects hair from damage and breakage caused from blow drying and heat styling tools. Detangles, adds moisture and leaves hair feeling soft, moveable and touchable with great shine. ​Pluma Designs is a boutique hair studio nestled in stunning Scottsdale, Arizona. We have thoughtfully worked to create an intimate salon environment that focuses completely on our clients and their individual needs. ​Pluma Designs is happy to introduce Team Pluma – talented stylists, working together, with a strong commitment to excellent customer service and professionalism. Come Along On a Life-Changing Journey with Co-Authors Hilda & Mary Beth! ​Living Brave is a vibrant series of books that feature inspiring life experiences from which we can all learn and grow. ​Within the Living Brave Series of books we have brought forth the concept of women lifting others through sharing their stories of living bravely. 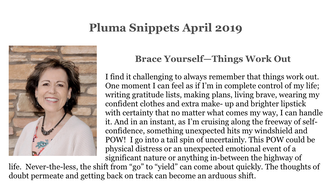 "Snippets" is the monthly newsletter authored by Hilda Villaverde, owner and manager of Pluma Designs. Full of styling tips, monthly specials, book club recommendations and great inspiration, Snippets is always a joyous read. Sign up today!